Tara Meyer and Garth Jones, Co-Head Instructors, Both 4th Dan. 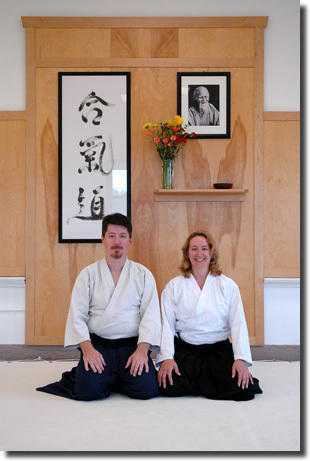 Tara began her training in 1987 at the University of Iowa Aikikai and Garth began a year later after their marriage. Their principal teacher at the time was Didier Bertrand (3rd Dan). The U. of I Aikikai was then part of the Midwest Aikido Federation under the direction of Akira Tohei Sensei (8th Dan), a direct student of O'Sensei. Garth and Tara attended many of Tohei Sensei's seminars around the midwest along with the MAF summer camps. After several years of training in the midwest, they moved to California for two years. Tara trained briefly at the Berkeley Aikikai (Shibata Sensei, 7th Dan) and they both practiced in a little garage behind instructor Marshall Pease's house. 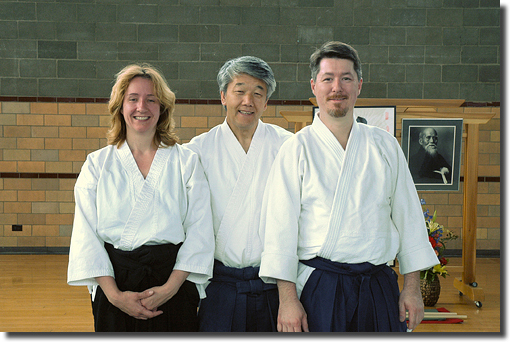 In 1994 the couple moved to Pittsburgh and joined Three Rivers Aikikai at Carnegie Mellon University. Since then they have counted as their teachers the senior students of Saotome Sensei (8th Dan), Hiroshi Ikeda Sensei (7th Dan), and Mary Heiny Sensei (6th Dan). At the beginning of 2006 they founded Allegheny Aikido. In the fall of 2016 they were both promoted to yondan (4th dan). Matt Fisher, Senior Instructor, 5th Dan. 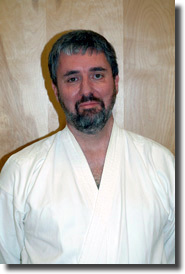 Matt Fisher started Aikido in 1982 at Aikido of Madison, in Madison, Wisconsin, under the guidance of John Stone Sensei (6th Dan) and Robin Cooper Sensei (6th Dan). He moved to Richmond, VA in 1991 and, while there, helped start Aikido in the Fan. Since 1995 Matt and his wife have lived in the Pittsburgh area; he was a senior instructor at Three Rivers Aikikai before helping Garth Jones and Tara Meyer start Allegheny Aikido. Matt holds the rank of yondan; his study of aikido has been primarily influenced by Saotome Sensei, Hiroshi Ikeda Sensei, John Stone Sensei, Robin Cooper Sensei, and Terry Dobson. Matt teaches the 8-9 PM class on Tuesdays. Chris Scarpinatto, Instructor, 3rd Dan. 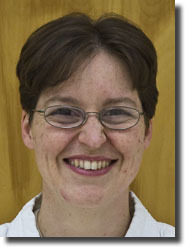 Chris began her aikido training at Three Rivers Aikikai in 1992. She was promoted to 2nd Dan in 2003 and tought regularly at Three Rivers Aikikai through 2008. For inspiration she looks to Hiroshi Ikeda Sensei and Mary Heiny Sensei. Chris moved to Brazil some time ago, but she remains a close friend and will always be part of our dojo no matter how far away she lives. Megan Nagy, Instructor, 2nd Dan. Megan Nagy was introduced to aikido in 1995 at the University of Florida's UF Aikido Club under Dr. Robert Ho (USAF) and Ward Wilson (ASU). 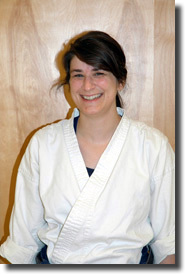 She began training seriously in 1999, and received her ikkyu certification before moving to Pittsburgh in August 2002. She joined Three Rivers Aikikai and resumed training seriously in 2003. She successfully tested for shodan in 2005 under Hiroshi Ikeda. Currently she trains regularly and teaches occassionally while working and raising a very busy baby boy.